LAS VEGAS (CelebrityAccess MediaWire) — The Stardust, a Las Vegas landmark for decades, will close forever on November 1st. One of the oldest hotels in the Las Vegas tourist destination known as "The Strip", the Stardust first opened in 1958. Built under the watchful eye of legendary casino mogul and bootlegger, Tony Cornero, for the princely sum of $10 millon dollars, it housed the biggest casino in Las Vegas when it opened its doors. Cornero did not live to see his casino open, dropping dead on the floor of the Desert Inn while gambling in 1955. 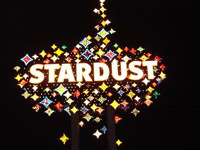 The Stardust had a number of innovations for its time, including the only first-run drive in theater in Las Vegas as well as the largest swimming pool in Nevada. Crooner Billy Daniels signed the first long-term entertainment contract in Las Vegas, agreeing to appear at the Stardust 40 weeks a year for a three year stint. The Stardust was also the first Las Vegas casino to allow female blackjack dealers, which doubled the casino's profits in the first year. Vegas icons Sigfried and Roy got their start at the Stardust, allegedly with help from reputed mob figure and sports handicapper Frank Rosenthal who discretely ran the Stardust. Rosenthal's connection later became grist for the 1995 Martin Scorsese film Casino. At present, the Stardust has 100,000 square feet of gaming space with room for 73 tables, nearly 2,000 slot machines, 2,100 guest rooms and a 25,000 square foot conference center.